Scuttling cuttlefish! 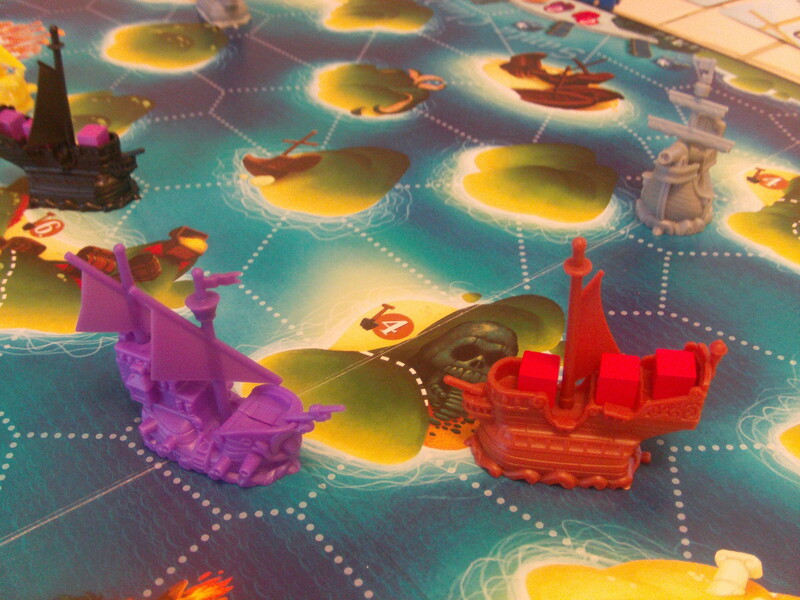 Board game sighted off the port bow! It appears to be loaded with doubloons and little cubes for the taking. And what’s this? 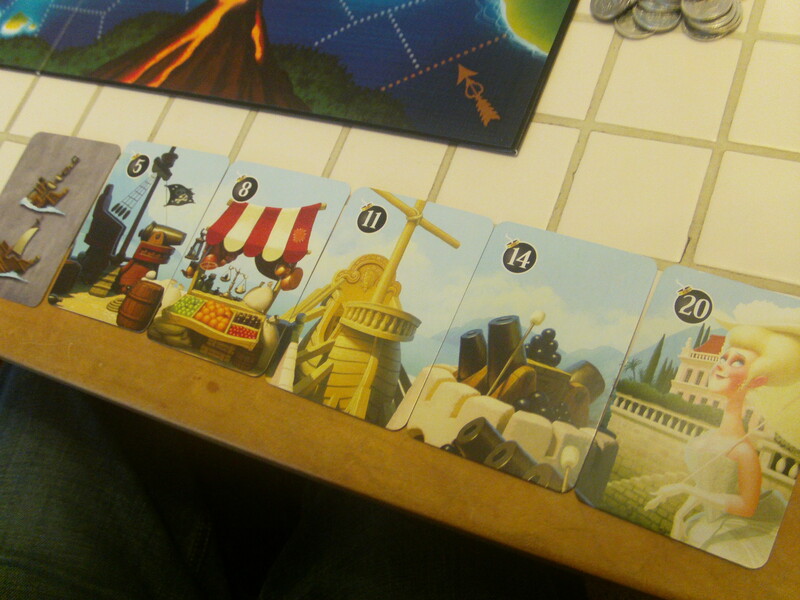 It appears to involve movement, but without dice rolling? Heave-ho, me hearties and haul this prize on board- we’ll see if she’s made of sterner stuff, after all! Well blow me down if it isn’t Black Fleet from Space Cowboys, a game for 3-4 players with voyages that last about an hour (give or take.) 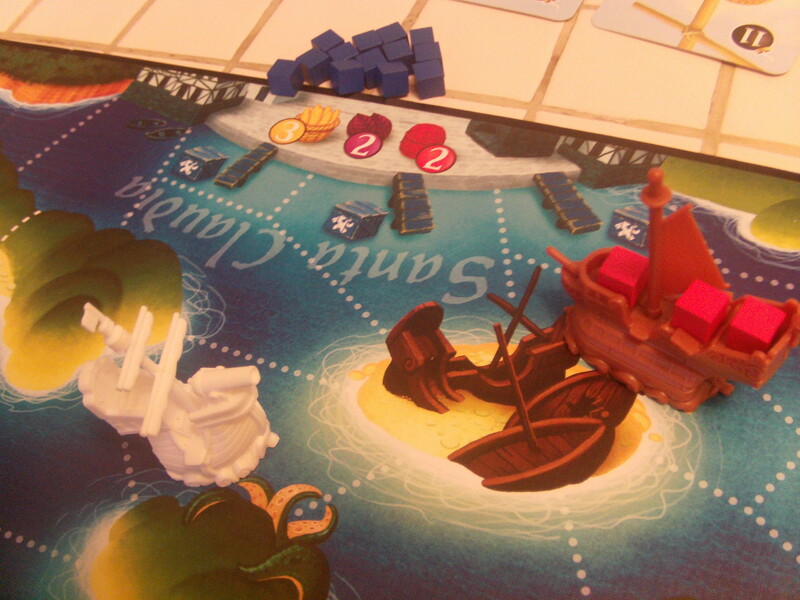 In this game, each player controls a Merchant ship (which sales from port to port, selling goods and filling their hold with new goods to sell at the next port) and a Pirate ship (who robs other players’ Merchant ships and then buries the stolen goods.) 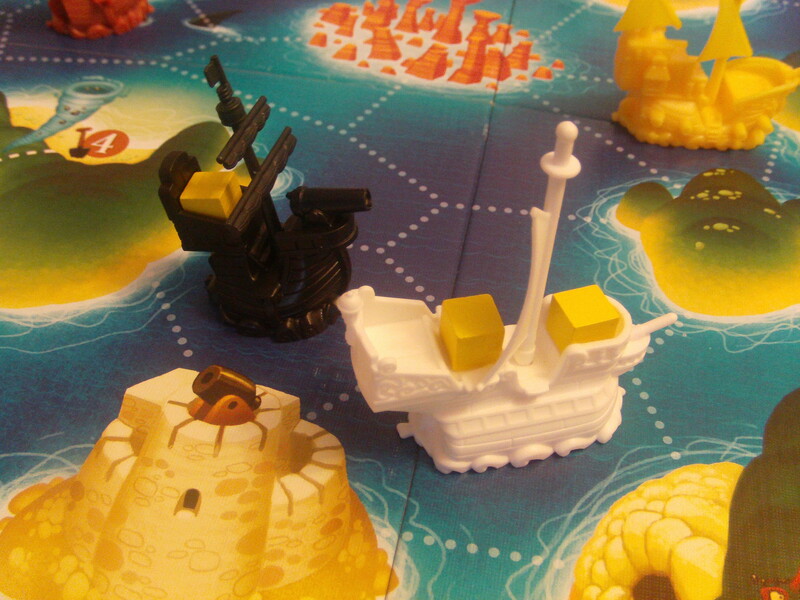 In addition, there are two Navy ships which are shared between players (who sink other players’ Pirate ships.) And what is the point of all this? Why, the pursuit of doubloons, of course, ye scurvy dog! Sell goods at a port with ye merchant, ye get doubloons! Steal goods with ye Pirate and ye get doubloons! Bury ye stolen treasure and ye get doubloons! Sink a pirate ship and ye get doubloons! Soon, ye’ll be sailing upon a veritable sea of shiny dosh. But what’s the use of glorious booty with nothing to spend it on, me hearties? Yer ultimate goal in this game is to raise the funds needed to pay the ransom to rescue the Governor’s daughter. Before ye can do that, however, ye’ll need to purchase four upgrade cards (in whichever order ye wish). Each of these upgrades will grant ye permanent abilities (such as being able to use navy ships to rob merchants, being able to move yer ships more spaces or even getting more money than ye would normally receive for doing different tasks). What’s more, every single upgrade card is different, so each player will play progressively more different from each other as they purchase more upgrades. Soon, ye’ll be crossing the sea in confidence! Which Movement Card to play? What’s more, the light-hearted tone and simple rules make this a great game for any cabin boys (or girls) ye may have bouncing around the hold- a great way to introduce the little kippers to life of a gamer. 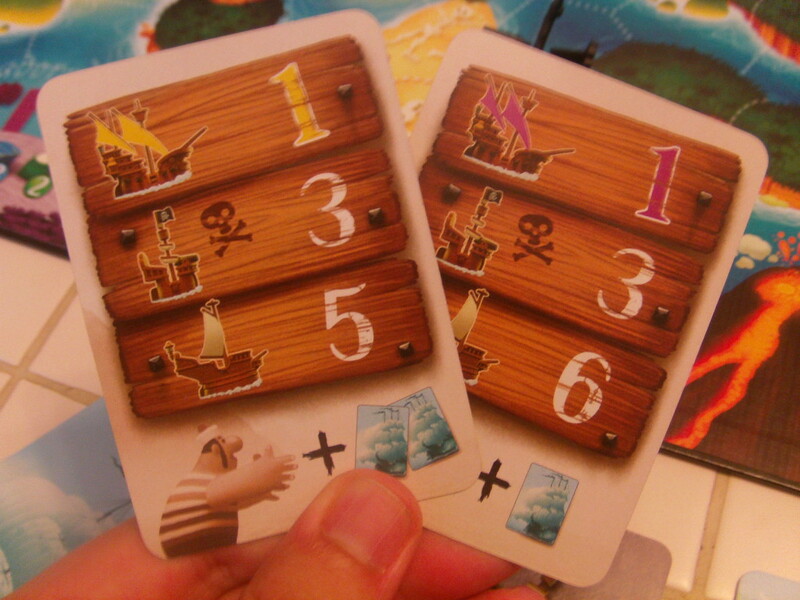 In addition, there are two differently priced ransom cards included (the final purchase that signals the end of the game) so if ye want a shorter or longer game, ye can easily arrange that. 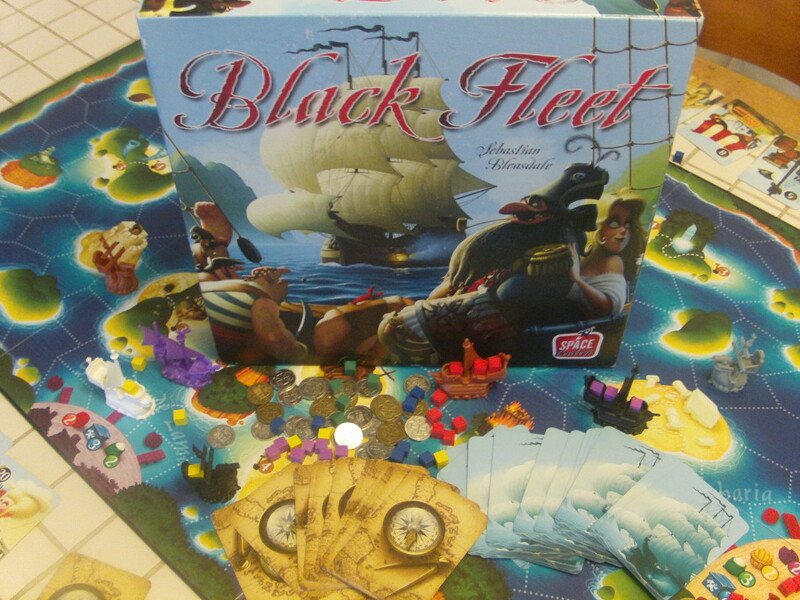 In the end, our crew heartily recommends ye add Black Fleet to yer own collection. Try it and ye’ll see we steered ye straight and true, as always.